It has long been my belief that there are not enough tarnished brass buckles in the world. 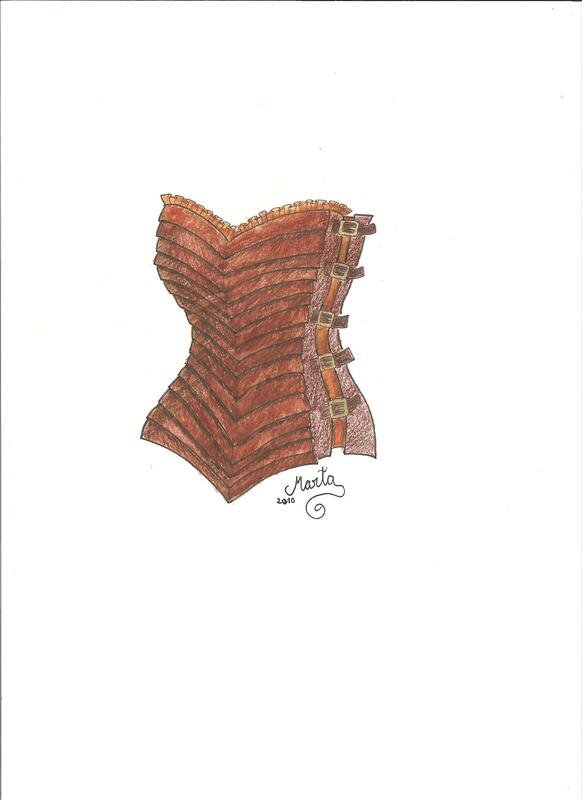 With the steampunk corset, Marta and I set out to rectify that. Fastening with buckles at the side, there is no need for either a busk or for lacing, and the corset should be easy to put on by onesself, without the irritation of having excess lacing hanging down the back or the need for a well built friend to get the damn thing laced up. It would probably be made of a heavy duty cotton, with plenty of interlining to make it pleasingly rigid and strong. I am going to make this for etsy, hopefully quite soon. Quicker if someone says they are interested in it! Marta’s royal outfit is done! I posted it off to her yesterday. I haven’t taken any pictures of the bolero or the petticoat, but I have no doubt that some will be along at some point. 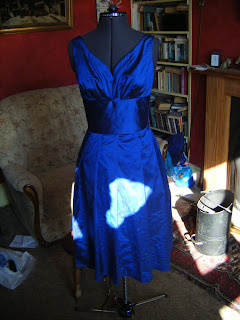 Here, at least, is a picture of the dress, before I had done the hem, and looking great from the front, although at the back the zip was wide open to allow it to fit on my mannequin. So now I am free to do a few other bits. Right now, I am working on my friend Kate’s christmas present. And it is only march! Admittedly I was meant to give it to her last year, but progress is progress! It is a Star Trek themed corset, which I started making quite a long time ago, before I had anywhere near the ability or knowledge to make it. This means that completing it is more a matter of making the best garment that I can from the nightmarish cluster of fabric that, if I recall, I told Kate would be finished “tomorrow”. That was the day I measured her. 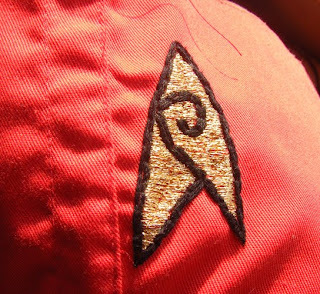 Anyway, if there is one part of this project that I am quite pleased with, it is the logo that I embroidered, which is also the main reason that I didn’t want to start over again, because a lot of time and effort had gone into that little part. After this is finished, which will hopefully not be too long, I am going to make another, much, much better corset for my cousin, now that I actually have some idea what I am doing. It’s going to be black coutil, based on a design from around the turn of the century. Pictures to come!